¶ 1 Leave a comment on paragraph 1 0 John Steuart Curry, Tragic Prelude, 1938-1940, Kansas State Capitol. ¶ 3 Leave a comment on paragraph 3 1 Slavery divided Americans from the beginning. But Americans demonstrated a shrewd ability to maintain unity despite these divisions. In the 1770s, all of England’s North American colonies relied on slave labor. Enslaved workers grew food, cultivated cash crops, worked in ports, and manufactured goods. Within a couple decades, however, slavery disappeared from half of the nation, and an antislavery movement began to challenge the ancient institution. Battles emerged over whether the institution would expand west. Enslaved laborers remained vitally important to the nation’s economy, fueling not only the southern plantation economy but also providing raw materials for the industrial North. As the antislavery movement grew, slaveholders managed to survive a range of challenges to their legitimacy in the 1830s, 1840s, and 1850s. By November 1860, however, a new challenger arose with the Republican Party. Republicans did not oppose racism, but they did unequivocally oppose the expansion of slavery. Differences over the fate of slavery remained at the heart of American politics, especially as the United States expanded. After decades of conflict, Americans north and south began to fear that the opposite section of the country had seized control of the government. During the secession crisis of 1860-1861, these fears, nearly a century in the making, at last devolved into bloody war. ¶ 5 Leave a comment on paragraph 5 0 This map, published by the US Coast Guard, shows the percentage of slaves in the population in each county of the slave-holding states in 1860. The highest percentages lie along the Mississippi River, in the “Black Belt” of Alabama, and coastal South Carolina, all of which were centers of agricultural production (cotton and rice) in the United States.E. Hergesheimer (cartographer), Th. 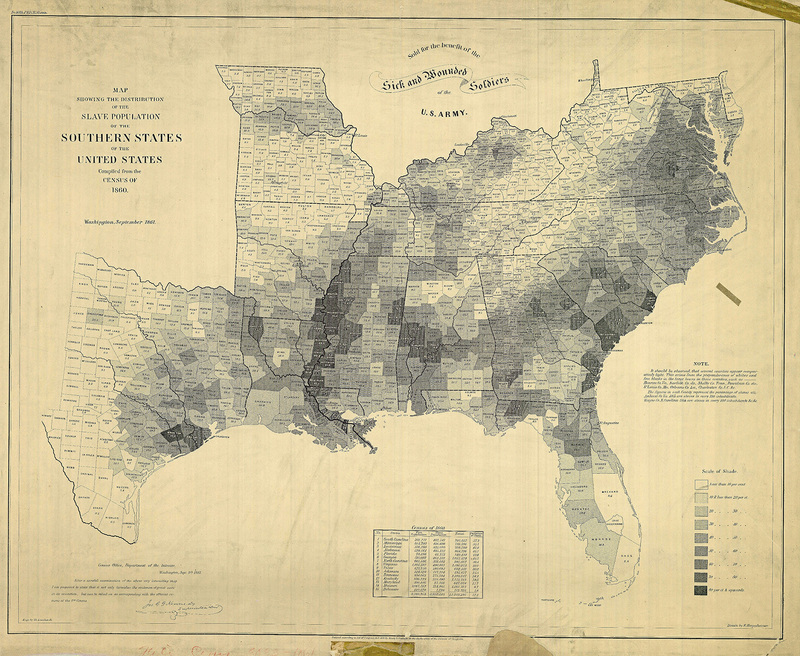 Leonhardt (engraver), Map Showing the Distribution of the Slave Population of the Southern States of the United States Compiled from the Census of 1860, c. 1861. Wikimedia, http://commons.wikimedia.org/wiki/File:SlavePopulationUS1860.jpg. ¶ 6 Leave a comment on paragraph 6 1 Slavery’s history stretched back to antiquity. Prior to the American Revolution, nearly everyone in the world accepted it as a natural part of life. English colonies north and south relied on enslaved workers who grew tobacco, harvested indigo and sugar, and worked in ports. They generated tremendous wealth for the British crown. That wealth and luxury fostered seemingly limitless opportunities, and inspired seemingly boundless imaginations. Enslaved workers also helped give rise to revolutionary new ideals, ideals that in time became the ideological foundations of the sectional crisis. English political theorists, in particular, began to re-think natural law justifications for slavery. They rejected the longstanding idea that slavery was a condition that naturally suited some people. A new transatlantic antislavery movement began to argue that freedom was the natural condition of man was freedom. ¶ 8 Leave a comment on paragraph 8 0 The Haitian Revolution marked an early origin of the sectional crisis. It helped splinter the Atlantic basin into clear zones of freedom and un-freedom, while in the process shattering the longstanding assumption that African slaves could not also be rulers. Despite the clear limitations of the American Revolution in attacking slavery, the era marked a powerful break in slavery’s history. Military service on behalf of both the English and the American army freed thousands of slaves. Many others simply used the turmoil of war to make their escape. As a result, free black communities emerged—communities that would continually reignite the antislavery struggle. For nearly a century, most white Americans were content to compromise over the issue of slavery, but the constant agitation of black Americans, both enslaved and free, kept the issue alive. ¶ 9 Leave a comment on paragraph 9 0 The national breakdown over slavery occurred over a long timeline and across a broad geography. Debates over slavery in the American West proved especially important. As the United States pressed westward in its search for new land and resources after its victory in the Revolution, new questions arose as to whether those lands ought to be slave or free. The framers of the Constitution did a little, but not much, to help resolve these early questions. Article VI of the 1787 Northwest Ordinance banned slavery north and west of the Ohio River. Many whites took it to mean that the founders intended for slavery to die out, as why else would they prohibit its spread across such a huge swath of territory? ¶ 11 Leave a comment on paragraph 11 0 New pressures challenging the delicate balance again arose in the West. The Louisiana Purchase of 1803 more than doubled the size of the United States. Questions immediately arose as to whether these lands would be made slave or free. Complicating matters further was the rapid expansion of plantation slavery fueled by the invention of the cotton gin in 1793. Yet even with the booming cotton economy, many Americans, including Thomas Jefferson, believed that slavery was a temporary institution and would soon die out. The Louisiana Purchase signaled the beginning of rising sectional feelings, but a truly sectional national debate did not yet emerge. ¶ 12 Leave a comment on paragraph 12 2 That debate, however, came quickly. Sectional differences tied to the expansion of plantation slavery in the West were especially important after 1803. The Ohio Valley became an early fault line in the coming sectional struggle. Kentucky and Tennessee emerged as slave states, while free states Ohio, Indiana (1816) and Illinois (1818) gained admission along the river’s northern banks. Borderland negotiations and accommodations along the Ohio River fostered a distinctive kind of white supremacy, as laws tried to keep blacks out of the West entirely. Ohio’s so-called “Black Laws,” of 1803 foreshadowed the exclusionary cultures of Indiana, Illinois, and several subsequent states of the Old Northwest and later, the Far West. These laws often banned African American voting, denied black Americans access to public schools, and made it impossible for non-whites to serve on juries and in local militias, among a host of other restrictions and obstacles. ¶ 13 Leave a comment on paragraph 13 1 The Missouri Territory, by far the largest section of the Louisiana Territory, marked a turning point in the sectional crisis. Saint Louis, a bustling Mississippi River town filled with powerful slave owners, loomed large as an important trade headquarters for networks in the northern Mississippi Valley and the Greater West. In 1817, eager to put questions of whether this territory would be slave or free to rest, Congress opened its debate over Missouri’s admission to the Union. Congressman James Tallmadge of New York stirred up the trouble by proposing laws that would gradually abolish slavery in the new state. Southern states responded with unanimous outrage, and the nation shuddered at an undeniable sectional controversy. ¶ 14 Leave a comment on paragraph 14 0 Congress reached a “compromise” on Missouri’s admission, largely through the work of Kentuckian Henry Clay. Maine would be admitted to the Union as a free state. In exchange, Missouri would come into the Union as a slave state. Legislators sought to prevent future conflicts by making Missouri’s southern border at 36° 30′ the new dividing line between slavery and freedom in the Louisiana Purchase lands. South of that line, running east from Missouri to the western edge of the Louisiana Purchase lands (near the present-day Texas panhandle) slavery could expand. North of it, encompassing what in 1820 was still “unorganized territory,” there would be no slavery. ¶ 15 Leave a comment on paragraph 15 0 The Missouri Compromise marked a major turning point in America’s sectional crisis because it exposed to the public just how divisive the slavery issue had grown. The debate filled newspapers, speeches, and Congressional records. Anti-slavery and pro-slavery positions from that point forward repeatedly returned to points made during the Missouri debates. Legislators battled for weeks over whether the Constitutional framers intended slavery’s expansion or not, and these contests left deep scars. Even seemingly simple and straightforward phrases like “All Men Are Created Equal” were hotly contested all over again. Questions over the expansion of slavery remained open, but nearly all Americans concluded that the Constitution protected slavery where it already existed. ¶ 16 Leave a comment on paragraph 16 0 Southerners were not yet advancing arguments that said slavery was a positive good, but they did insist during the Missouri Debate that the framers supported slavery and wanted to see it expand. In Article 1, Section 2, for example, the Constitution enabled representation in the South to be based on rules defining enslaved people as 3/5 of a voter, meaning southern white men would be overrepresented in Congress. The Constitution also stipulated that Congress could not interfere with the slave trade before 1808, and enabled Congress to draft fugitive slave laws. ¶ 17 Leave a comment on paragraph 17 0 Antislavery participants in the Missouri debate argued that the framers never intended slavery to survive the Revolution and in fact hoped it would disappear through peaceful means. The framers of the Constitution never used the word “slave.” Slaves were referred to as “persons held in service,” perhaps referring to English common law precedents that questioned the legitimacy of “property in man.” Anti-slavery arguers also pointed out that while the Congress could not pass a law limiting the slave trade by 1808, the framers had also recognized the flip side of the debate and had thus opened the door to legislating the slave trade’s end once the deadline arrived. Language in the Tenth Amendment, they claimed, also said slavery could be banned in the territories. Finally, they pointed to the due process clause of the Fifth Amendment, which said that property could be seized through appropriate legislation. The bruising Missouri debates ultimately transcended arguments about the Constitution. They became an all-encompassing referendum on the American past, present, and future. ¶ 18 Leave a comment on paragraph 18 0 Despite the furor, debates over slavery unleashed during the Missouri Compromise did not yet develop into hardened defenses of either slave or free labor as positive good. Those would come in the coming decades, but in the meantime the uneasy consensus forged by the Missouri Debate managed to bring a measure of calm. ¶ 21 Leave a comment on paragraph 21 0 Missouri’s admission to the Union in 1821 exposed deep fault lines in American society. But the Compromise created a new sectional consensus that most white Americans, at least, hoped would ensure a lasting peace. Through sustained debates and arguments, white Americans agreed that the Constitution could do little about slavery wherever it already existed and that slavery, with the State of Missouri as the key exception, would never expand north of the 36°30′ line. ¶ 22 Leave a comment on paragraph 22 0 Once again westward expansion challenged this consensus, and this time the results proved even more damaging. Tellingly, enslaved southerners were among the first to signal their discontent. A rebellion led by Denmark Vesey in 1822 threatened lives and property throughout the Carolinas. The nation’s religious leaders also expressed a rising discontent with the new status quo. The Second Great Awakening further sharpened political differences by promoting schisms within the major Protestant churches, schisms that also became increasingly sectional in nature. Between 1820 and 1846, sectionalism drew on new political parties, new religious organizations, and new reform movements. ¶ 23 Leave a comment on paragraph 23 1 As politics grew more democratic, leaders attacked old inequalities of wealth and power, but in doing so many pandered to a unity under white supremacy. Slavery briefly receded from the nation’s attention in the early 1820s, but that would change quickly. By the last half of the decade, slavery was back, and this time it appeared even more threatening. ¶ 25 Leave a comment on paragraph 25 0 The Democratic Party initially seemed to offer a compelling answer to the problems of sectionalism by promising benefits to white working men of the North, South, and West, while also uniting rural, small town, and urban residents. Indeed, huge numbers of western, southern, and northern workingmen rallied during the 1828 Presidential election behind Andrew Jackson. Slavery’s aristocratic culture was a prickly issue of potential contradiction for the workingman’s party, but Democrats nonetheless had broad appeal in the South, where most men did not own slaves. The Democratic Party tried to avoid the issue of slavery and instead sought to unite Americans around shared racial anxieties and desires to expand the nation. ¶ 26 Leave a comment on paragraph 26 0 Democrats were not without their critics during their decade of dominance in the 1830s. In time, the slavery issue again gained energy over ongoing dilemmas about what to do with western lands. Northerners seen as especially friendly to the South had become known as “Doughfaces” during the Missouri debates, and as the 1830s wore on, more and more Doughfaced Democrats became vulnerable to the charge that they served the Southern slave oligarchs better than they served their own northern communities. Whites discontented with the direction of the country used the slur and other critiques to help chip away at Democratic Party majorities. The accusation that northern Democrats were lap-dogs for southern slaveholders had tremendous power. ¶ 27 Leave a comment on paragraph 27 0 The major party challenge to the Democrats arose with the Whigs. Whig strongholds often mirrored the patterns of westward migrations out of New England. With an odd coalition of wealthy merchants, middle and upper class farmers, planters in the Upland South, and settlers in the Great Lakes, Whigs struggled to bring a cohesive message to voters during the 1830s. Their strongest support came from places like Ohio’s Western Reserve, the rural and Protestant-dominated areas of Michigan, and similar parts of Protestant and small-town Illinois, particularly the fast-growing towns and cities of the state’s northern half. ¶ 28 Leave a comment on paragraph 28 0 Whig leaders stressed Protestant culture, federal-sponsored internal improvements, and courted the support of a variety of reform movements, including of course temperance, Nativism, and even anti-slavery, though few Whigs believed in racial equality. These positions attracted a wide range of figures, including a young convert to politics named Abraham Lincoln. Lincoln admired Whig leader Henry Clay of Kentucky, and by the early 1830s, Lincoln certainly fit the image of developing Whig. A veteran of the Black Hawk War, Lincoln had re-located to New Salem, Illinois, where he worked a variety of odd jobs, living a life of thrift, self-discipline, and sobriety as he educated himself in preparation for a professional life in law and politics. ¶ 29 Leave a comment on paragraph 29 1 The Whig Party blamed Democrats for defending slavery at the expense of the American people, but antislavery was never a core component of the Whig platform. Several abolitionists grew so disgusted with the Whigs that they formed their own party, a true antislavery party. Activists in Warsaw, New York, a small town located outside of Buffalo, went to work and organized the anti-slavery Liberty Party in 1839. Liberty leaders demanded the end of slavery in the District of Columbia, the ending the interstate slave trade, and the prohibition of slavery’s further expansion into the West. But the Liberty Party also shunned women’s participation in the movement, and distanced themselves from visions of true racial egalitarianism. Few Americans voted for the party, however, and the Democrats and Whigs continued to dominate American politics. ¶ 31 Leave a comment on paragraph 31 1 Events in Texas would shatter the balance. Independent Texas soon gained recognition from a supportive Andrew Jackson administration in 1837. But Jackson’s successor, President Martin Van Buren, also a Democrat, soon had reasons to worry about the Republic of Texas. Texas struggled with ongoing conflicts with Mexico and Indian raids from the powerful Comanche. The 1844 democratic presidential candidate James K. Polk sought to bridge the sectional divide by promising new lands to whites north and south. Polk cited the annexation of Texas and the Oregon Territory as campaign cornerstones. Yet as Polk championed the acquisition of these vast new lands, northern Democrats grew annoyed by their southern colleagues, especially when it came to Texas. ¶ 32 Leave a comment on paragraph 32 0 For many observers, the debates over Texas statehood illustrated that the federal government had at last moved in a clear pro-slavery direction. Texas President Sam Houston managed to secure a deal with Polk, and gained admission to the Union for Texas in 1845. Anti-slavery northerners were also worried about the admission of Florida, which also entered the Union as slave state in 1845. The year 1845 became a pivotal year in the memory of anti-slavery leaders. As Americans embraced calls to pursue their “Manifest Destiny,” anti-slavery voices looked at developments in Florida and Texas as signs that the sectional crisis had taken an ominous and perhaps irredeemable turn. ¶ 33 Leave a comment on paragraph 33 0 The 1840s opened with a number of disturbing developments for anti-slavery leaders. The 1842 Supreme Court case Prigg v. Pennsylvania ruled that the federal government’s Fugitive Slave Act trumped Pennsylvania’s personal liberty law. Antislavery activists believed that the federal government only served southern slaveholders and were trouncing the states’ rights of the North. A number of northern states reacted by passing new personal liberty laws in protest in 1843. ¶ 34 Leave a comment on paragraph 34 1 The rising controversy over the status of fugitive slaves swelled partly through the influence of escaped former slaves, including Frederick Douglass. Douglass’s entrance into northern politics marked an important new development in the nation’s coming sectional crisis, as the nation’s beleaguered community of freed black northerners gained perhaps its most powerful voice. Born into slavery in 1818 at Talbot County, Maryland, Douglass grew up, like many enslaved people, barely having known his own mother or date of birth. And yet because of a range of unique privileges afforded him by the circumstances of his upbringing, as well as his own pluck and determination, Douglass managed to learn how to read and write. He used these skills to escape from slavery in 1837, when he was just nineteen. By 1845, Douglass put the finishing touches on his autobiography, Narrative of the Life of Frederick Douglass. The book launched his life-long career as an advocate for the enslaved and the oppressed and helped further raise the visibility of black politics nationally. Other former slaves, including Sojourner Truth joined Douglass in rousing support for antislavery, as did free blacks like Maria Stewart, James McCune Smith, Martin Delaney and numerous others. But black activists did more than deliver speeches. They also attacked fugitive slave laws by helping thousands to escape. The incredible career of Harriet Tubman is one of the more dramatic examples. But the forces of slavery had powerful allies at every level of government. ¶ 35 Leave a comment on paragraph 35 0 The year 1846 signaled new reversals to the anti-slavery cause, and the beginnings of a dark new era in American politics. President Polk and his Democratic allies were eager to see western lands brought into the Union, and were especially anxious to see the borders of the nation extended to the shores of the Pacific Ocean. Critics of the administration blasted these efforts as little more than land-grabs on behalf of the slaveholders. Events in early 1846 seemed to justify anti-slavery complaints. Since Mexico had never recognized independent Texas, it continued to lay claim to its lands, even after the United States admitted it to the Union. In January 1846, Polk ordered troops to Texas to enforce claims stemming from its border dispute along the Rio Grande. Polk asked for war on May 11, 1846, and by September 1847, after campaigns conquering all or most of present-day California, New Mexico, Nevada, Utah, Colorado, and Wyoming and Arizona (lands west of the Louisiana Purchase excepting for Pacific Northwest) United States forces entered Mexico City. Whigs, like Abraham Lincoln, found their protests sidelined, but anti-slavery voices were becoming more vocal and more powerful. ¶ 36 Leave a comment on paragraph 36 0 After 1846, the sectional crisis raged throughout North America. Debates swirled over whether the new lands would be slave or free. The South began defending slavery as a positive good. At the same time, Congressman David Wilmot submitted his “Wilmot Proviso” late in 1846, banning the expansion of slavery into the territories won from Mexico. The Proviso gained widespread northern support and even passed the House with bipartisan support, but in the Senate it failed. ¶ 38 Leave a comment on paragraph 38 0 The conclusion of the Mexican War gave rise to the 1848 Treaty of Guadeloupe Hidalgo. The treaty infuriated anti-slavery leaders in the United States. The spoils gained from the Mexican War were impressive, but it was clear they would help expand slavery. In the end, the United States brokered a deal to purchase the California and New Mexico Territories for $15 million dollars. This acquisition included lands that would become the future states of California, Utah, Nevada, most of Arizona, and well as parts of New Mexico, Colorado, and Wyoming. Also in 1848, the administration worked to create the Oregon Territory. ¶ 39 Leave a comment on paragraph 39 0 Questions about the balance of free and slave states in the Union became even more fierce after the US acquired these territories from Mexico by the 1848 in the Treaty of Guadalupe Hidalgo. Map of the Mexican Cession. WIkimedia, http://commons.wikimedia.org/wiki/File:Mexican_Cession.png. ¶ 40 Leave a comment on paragraph 40 0 The acquisition of so much land made it imperative to anti-slavery leaders that these lands not be opened to slavery. But knowing that the Liberty Party was not likely to provide a home to many moderate voters, leaders instead hoped to foster a new and more competitive party, which they called the Free Soil Party. Anti-slavery leaders came into the 1848 election hoping that their vision of a federal government divorced from slavery might be heard. But both the Whigs and the Democrats, nominated pro-slavery southerners. Left unrepresented, anti-slavery Free Soil leaders swung into action. ¶ 41 Leave a comment on paragraph 41 0 Demanding an alternative to the pro-slavery status quo, Free Soil leaders assembled so-called “Conscience Whigs,” like those found in Massachusetts under Charles Francis Adams, alongside western ex-Liberty Party leaders like Salmon P. Chase of Ohio. The new coalition called for a national convention in August 1848 at Buffalo, New York. A number of ex-Democrats committed to the party right away, including an important group of New Yorkers loyal to Martin Van Buren. The Free Soil Party’s platform bridged the eastern and the western leadership together and called for an end to slavery in Washington DC and a halt on slavery’s expansion in the territories. The Free Soil movement hardly made a dent in the 1848 Presidential election, but it drew more than four times the popular vote that the Liberty Party had won earlier. It was a promising start. In 1848, Free Soil leaders claimed just 10% of the popular vote, but won over a dozen House seats, and even managed to win one Senate seat in Ohio, which went to Salmon P. Chase. In Congress, Free Soil members had enough votes to swing power to either the Whigs or the Democrats. ¶ 42 Leave a comment on paragraph 42 0 The admission of Wisconsin as a free state in May 1848 helped cool tensions after the Texas and Florida admissions. But news from a number of failed revolutions in Europe alarmed American reformers. As exiled radicals filtered out of Europe and into the United States, a women’s rights movement also got underway in July at Seneca Falls, New York. Representing the first of such meetings ever held in United States history, it was led by figures like Elizabeth Cady Stanton and Lucretia Mott, women with deep ties to the abolitionist cause. Frederick Douglass also appeared at the convention and took part in the proceedings, where participants debated the Declaration of Sentiments, Grievances and Resolutions. By August 1848, it seemed plausible that the Free Soil Movement might tap into these reforms and build a broader coalition. In some ways that is precisely what it did. But come November, the spirit of reform failed to yield much at the polls. Whig candidate Zachary Taylor bested Democrat Lewis Cass of Michigan. ¶ 43 Leave a comment on paragraph 43 1 The upheavals signaled by 1848 came to a quick end. Taylor remained in office only a brief time until his unexpected death from a stomach ailment in 1850. During Taylor’s brief time in office, the fruits of the Mexican War began to spoil, threatening the whole country with sickness. While he was alive, Taylor and his administration struggled to find a good remedy. Increased clamoring for the admission of California, New Mexico, and Utah pushed the country closer to the edge. Gold had been discovered in California, and as thousands continued to pour onto the West Coast and through the trans-Mississippi West, the admission of new states loomed. In Utah, Mormons were also making claims to an independent state they called Deseret. By 1850, California wanted admission as a slave state. With so many competing dynamics underway, and with the President dead and replaced by Whig Millard Fillmore, the 1850s were off to a troubling start. ¶ 44 Leave a comment on paragraph 44 0 Congressional leaders like Henry Clay and newer legislators like Stephen A. Douglas of Illinois were asked to broker a compromise, but this time it was clear no compromise could bridge all the diverging interests at play in the country. Clay eventually left Washington disheartened by affairs. It fell to young Stephen Douglas, then, to shepherd the bills through the Congress, which he in fact did. 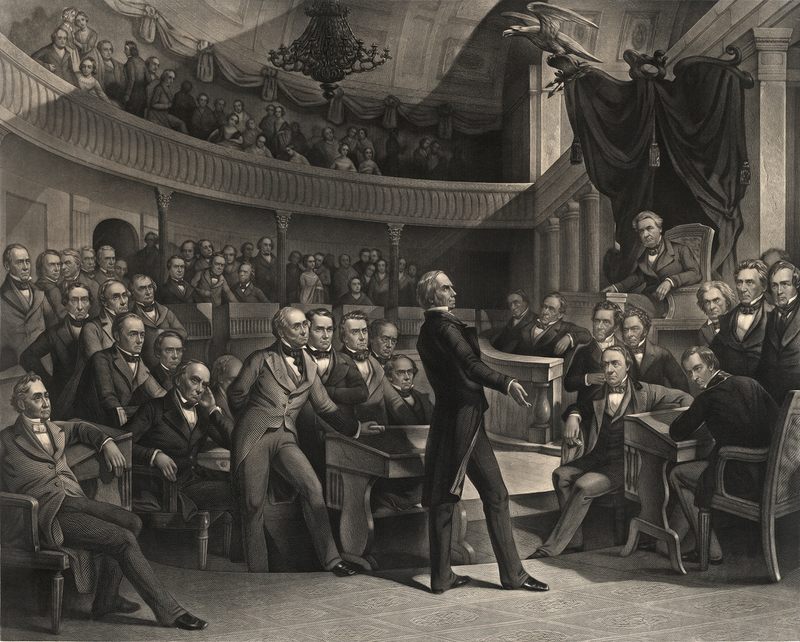 Legislators rallied behind the “Compromise of 1850,” an assemblage of bills passed late in 1850, managed to keep the promises of the Missouri Compromise alive. ¶ 46 Leave a comment on paragraph 46 0 The Compromise of 1850 tried to offer something to everyone, but in the end it only worsened the sectional crisis. For southerners, the package offered a tough new fugitive slave law that empowered the federal government to deputize regular citizens in assisting with the arrest of runaways. 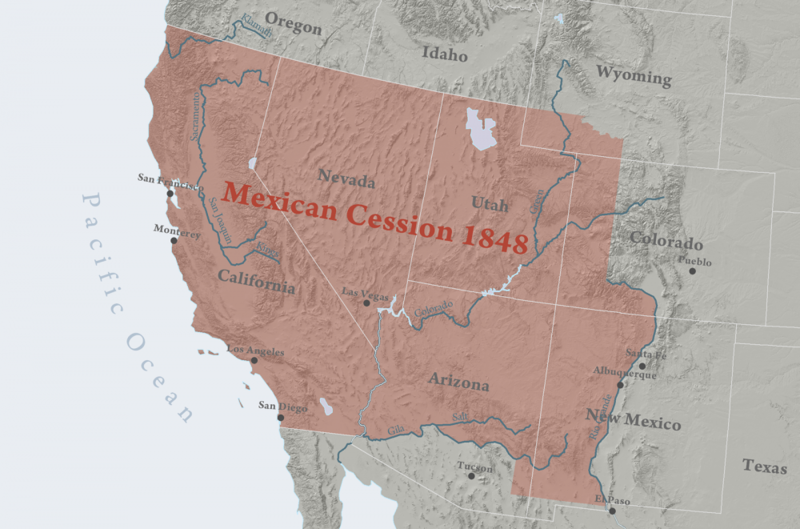 The New Mexico territory, meanwhile, newly buttressed by additional lands from the nearby State of Texas, (Texas gave away some of its lands to erase some of its debts) and the Utah Territory, would be allowed to determine their own fates as slave or free states based on popular sovereignty. The Compromise also allowed territories to submit suits directly to the Supreme Court over the status of fugitive slaves within its bounds. ¶ 47 Leave a comment on paragraph 47 1 The admission of California as the newest free state in the Union cheered many northerners, but even the admission of a vast new state full of resources and rich agricultural lands did not fully satisfy many northerners. In addition to California, northerners also gained a ban on the slave trade in Washington, D.C., but not the full emancipation abolitionists had long strived for. Texas, which had already come into the Union as a slave state, was asked to give its lands up and give them to New Mexico. This, proponents argued, might limit the number of representatives Texas could send as a slave state, and in the process help perhaps bolster the number of free state voters in New Mexico. But the Compromise debates soon grew ugly. ¶ 48 Leave a comment on paragraph 48 0 After the Compromise of 1850 debates, anti-slavery critics became increasingly certain that slaveholders had co-opted the federal government, and that a southern “Slave Power” secretly held sway in Washington, where it hoped to use its representative advantages, built into the 3/5 compromise of the Constitution, to make slavery a national institution. This idea had floated around anti-slavery circles for years, but in the 1850s anti-slavery leaders increasingly argued that Washington worked on behalf of slaveholders while ignoring the interests of white working men. ¶ 49 Leave a comment on paragraph 49 0 The 1852 Presidential election gave the Whigs their most stunning defeat and effectively ended their existence as a national political party. Whigs captured just 42 of the 254 electoral votes needed to win. With the Compromise of 1850 in place, with plenty of new lands for white settlers to improve, everything seemed in its right place for a peaceful consensus to re-emerge. Anti-slavery feelings continued to run deep, however, and their depth revealed that with a Democratic Party misstep, a coalition united against the Democrats might yet emerge and bring them to defeat. One measure of the popularity of anti-slavery ideas came in 1852 when Harriet Beecher Stowe published her bestselling anti-slavery novel, Uncle Tom’s Cabin. Sales for Uncle Tom’s Cabin were astronomical, eclipsed only by sales of the Bible. The book became a sensation and helped move antislavery into everyday conversation for many northerners. Despite the powerful antislavery message, Stowe’s book also reinforced many racist stereotypes. Even abolitionists struggled with the deeply ingrained racism that plagued American society. While the major success of Uncle Tom’s Cabin bolstered the abolitionist cause, the terms outlined by the Compromise of 1850 appeared strong enough to keep the peace. ¶ 50 Leave a comment on paragraph 50 0 Uncle Tom’s Cabin intensified an already hot debate over slavery throughout the United States. The book revolves around Eliza (the woman holding the young boy) and Tom (standing with his wife Chloe), each of whom takes a very different path: Eliza escapes slavery using her own two feet, but Tom endures his chains only to die by the whip of a brutish master. The horrific violence that both endured melted the hearts of many northerners and pressed some to join in the fight against slavery. 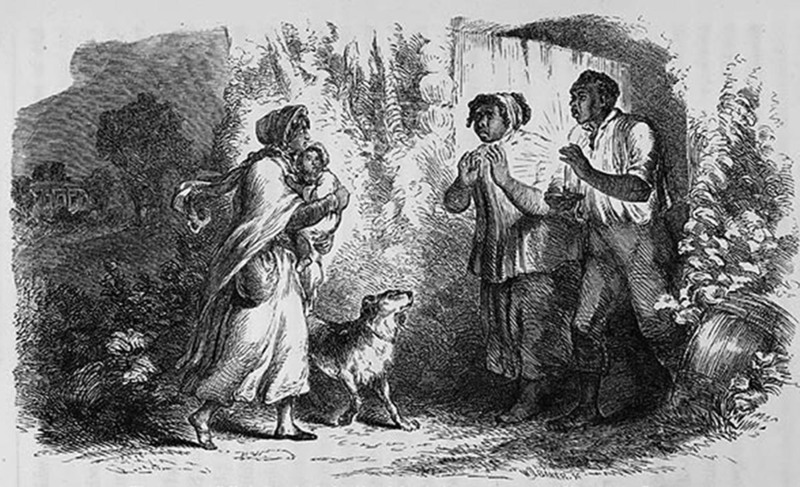 Full-page illustration by Hammatt Billings for Uncle Tom’s Cabin, 1852. Wikimedia, http://commons.wikimedia.org/wiki/File:ElizaEngraving.jpg. 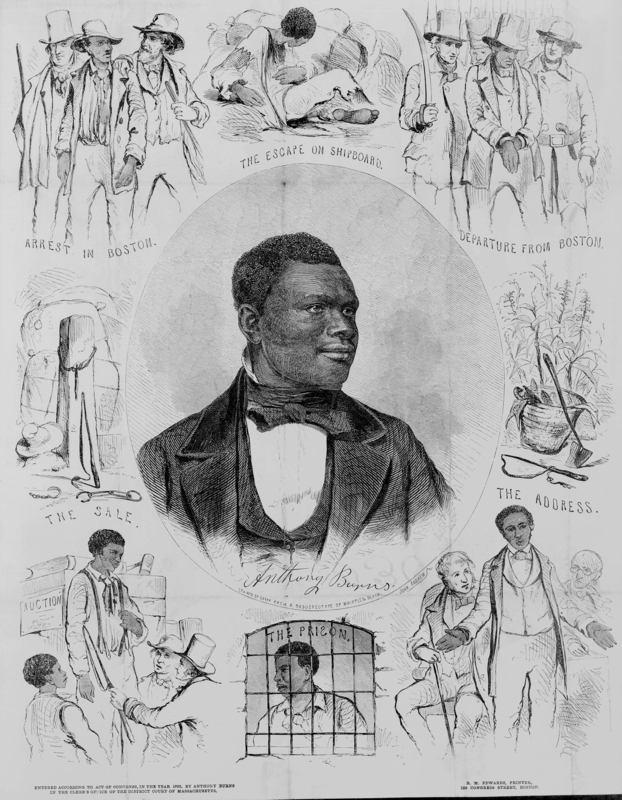 ¶ 54 Leave a comment on paragraph 54 0 Anthony Burns, the fugitive slave, appears in a portrait at the center of this 1855. Burns’ arrest and trial, possible because of the 1850 Fugitive Slave Act, became a rallying cry. As a symbol of the injustice of the slave system, Burns’ treatment spurred riots and protests by abolitionists and citizens of Boston in the spring of 1854. John Andrews (engraver), “Anthony Burns,” c. 1855. Library of Congress, http://www.loc.gov/pictures/item/2003689280/. ¶ 55 Leave a comment on paragraph 55 0 As northerners radicalized, organizations like the New England Emigrant Aid Society provided guns and other goods for pioneers willing to go to Kansas and establish the territory as anti-slavery through the doctrines of popular sovereignty. On all sides of the slavery issue, politics became increasingly militarized. ¶ 56 Leave a comment on paragraph 56 0 The year 1855 nearly derailed the northern anti-slavery coalition. A resurgent anti-immigrant movement briefly took advantage of the Whig collapse, and nearly stole the energy of the anti-administration forces by channeling its frustrations into fights against the large number of mostly Catholic German and Irish immigrants then flooding American cities. Calling themselves “Know-Nothings,” on account of their tendency to pretend ignorance when asked about their activities, the Know-Nothing or American Party made impressive gains, particularly in New England and the Middle Atlantic, in races throughout 1854 and 1855. But the anti-immigrant movement simply could not capture the nation’s attention in the ways the anti-slavery movement already had. ¶ 57 Leave a comment on paragraph 57 0 The anti-slavery political movements that started in 1854 and 1855 coalesced as the coming Presidential election of 1856 accelerated the formation of a political party. Harkening back to the founding fathers, this new party called itself the Republican Party. After a thrilling convention that helped launch the national party at Pittsburgh in February, Republicans moved into a highly charged summer expecting great things for their cause. 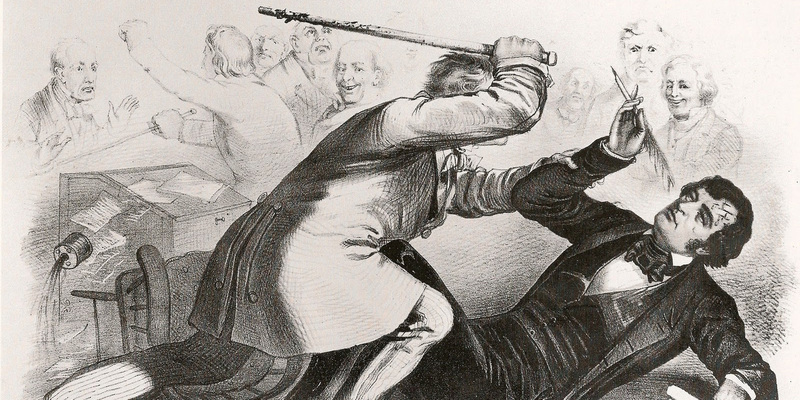 Following an explosive speech before Congress on May 19-20, Charles Sumner was beaten by congressional representative Preston Brooks of South Carolina right on the floor of the Senate chamber. Among other accusations, Sumner accused Senator Andrew Butler of South Carolina of defending slavery so he could have sexual access to black women. Butler’s cousin, representative Brooks felt that he had to defend his relative’s honor, and nearly killed Sumner as a result. ¶ 58 Leave a comment on paragraph 58 0 The Caning of Charles Sumner, 1856. Wikimedia, http://commons.wikimedia.org/wiki/File:Southern_Chivalry.jpg. ¶ 60 Leave a comment on paragraph 60 0 With sectional tensions at a breaking point, both parties readied for the coming Presidential election. In June 1856, the newly named Republican Party held its nominating national convention at Philadelphia, and selected Californian John Charles Frémont. Frémont’s anti-slavery credentials may not have pleased many abolitionists, but his dynamic and talented wife, Jessie Benton Frémont, appealed to more radical members of the coalition. The Kansas-Nebraska Debate, the organization of the Republican Party, and the 1856 Presidential Campaign all energized a new generation of political leaders, including Abraham Lincoln. Beginning with his speech at Peoria, Illinois, in 1854, Lincoln carved out a message that encapsulated better than anyone else the main ideas and visions of the Republican Party. Lincoln himself was slow to join the coalition, yet by the summer of 1856, Lincoln had fully committed to the Frémont campaign. ¶ 63 Leave a comment on paragraph 63 0 White anti-slavery leaders in the North were left to wonder what happened in November 1856, but few took the news too hard. They hailed Frémont’s defeat as a “glorious” one and looked ahead to the party’s future successes. For those still in slavery, or hoping to see loved ones freed, the news was of course much harder to take. The Republican Party had promised the rise of an anti-slavery coalition, but voters rebuked it. The lessons seemed clear enough. ¶ 66 Leave a comment on paragraph 66 0 In the days after the 1856 Presidential election, Buchanan made his plans for his time in office clear. He talked with Chief Justice Roger Taney on inauguration day about a court decision he hoped to see handled during his time in office. Indeed, not long after the inauguration, the Supreme Court handed down a decision that would come to define Buchanan’s Presidency. 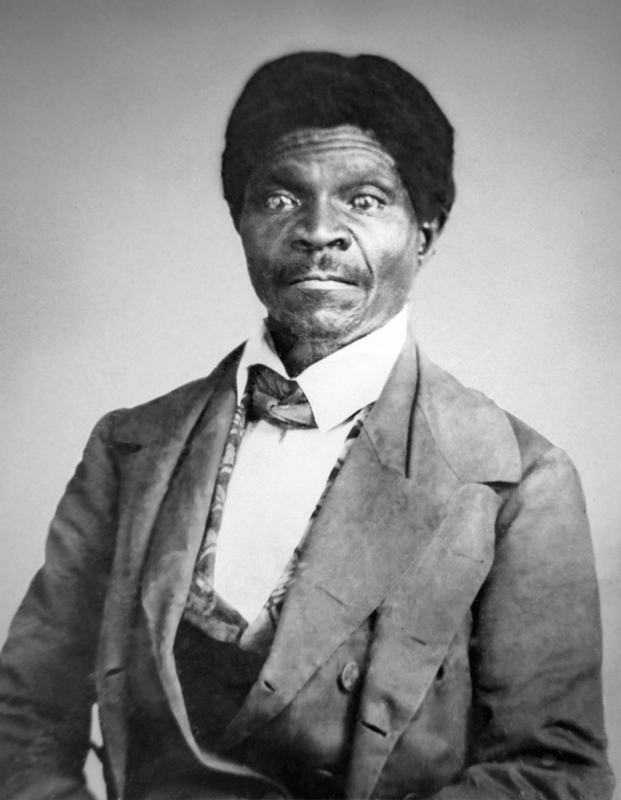 The Dred Scott decision, Scott v. Sandford, ruled that black Americans could not be citizens of the United States. This gave the Buchanan administration and its southern allies a direct repudiation of the Missouri Compromise. The court ruled that Scott, a Missouri slave, had no right to sue in United States courts. The Dred Scott decision signaled that the federal government was now fully committed to extending slavery as far and as wide as it might want. ¶ 69 Leave a comment on paragraph 69 0 The Illinois Senate race in 1858 put the scope of the sectional crisis on full display. Republican candidate Abraham Lincoln challenged the greatly influential Democrat Stephen Douglas. Pandering to appeals to white supremacy, Douglas hammered the Republican opposition as a “Black Republican” party bent on racial equality. The Republicans, including Lincoln, were thrown on the defensive. Democrats hung on as best they could, but the Republicans won the House of Representatives and picked up seats in the Senate. Lincoln actually lost his contest with Stephen Douglas, but in the process firmly established himself as a leading national Republican. After the 1858 elections, all eyes turned to 1860. Given the Republican Party’s successes since 1854, it was expected that the 1860 Presidential election might produce the nation’s first anti-slavery president. ¶ 70 Leave a comment on paragraph 70 0 In the troubled decades since the Missouri Compromise, the nation slowly tore itself apart. Congressman clubbed each other nearly to death on the floor of the Congress, and by the middle 1850s Americans were already at war on the Kansas and Missouri plains. Across the country, cities and towns were in various stages of revolt against federal authority. Fighting spread even further against Indians in the Far West and against Mormons in Utah. The nation’s militants anticipated a coming breakdown, and worked to exploit it. 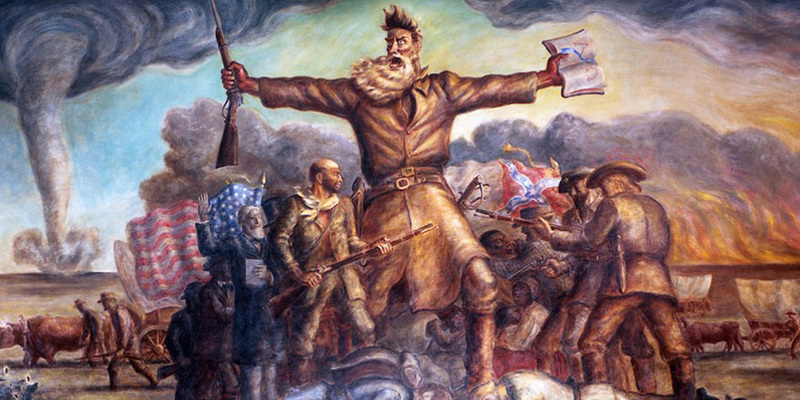 John Brown, fresh from his actions in Kansas, moved east and planned more violence. Assembling a team from across the West, including black radicals from Oberlin, Ohio, and throughout communities in Canada West, Brown hatched a plan to attack Harper’s Ferry, a federal weapon’s arsenal in Virginia (now West Virginia). He would use the weapons to lead a slave revolt. Brown approached Frederick Douglass, though Douglass refused to join. ¶ 71 Leave a comment on paragraph 71 0 John Brown implored Frederick Douglass, the African American leader, to join him on the raid at Harper’s Ferry. Though Douglass would not join him, he became labelled as a co-conspirator. He made a strong case for his legal innocence, but also embraced Brown as an ally and approved of his violent methods. This simultaneous distancing from yet uniting with Brown was a common tactic for abolitionists and Republicans after the raid in 1859. 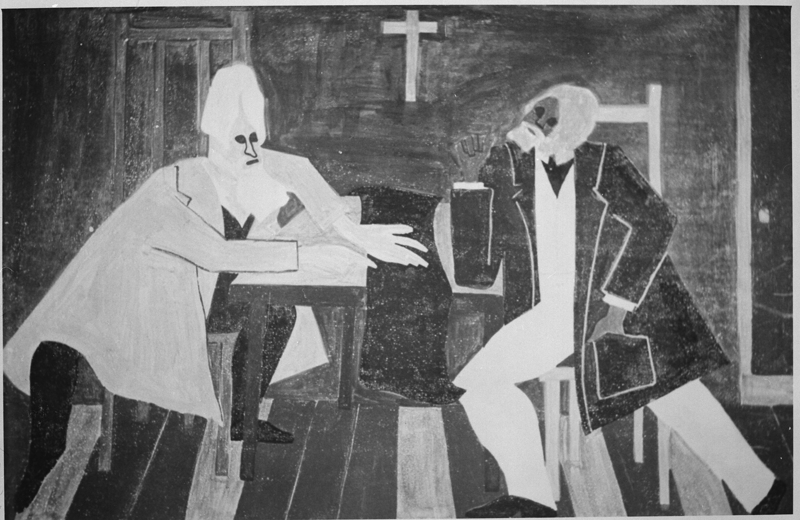 Jacob Lawrence, the great 20th-century African American artist, depicted a tense moment wherein Brown beseeches Douglass for his participation and support. Jacob Lawrence, Douglass argued against John Brown’s plan to attack the arsenal at Harper’s Ferry. Wikimedia. ¶ 73 Leave a comment on paragraph 73 0 The execution of John Brown made him a martyr in abolitionist circles and a confirmed traitor in southern crowds. Both of these images continued to pervade public memory after the Civil War, but in the North especially (where so many soldiers had died to help end slavery) his name was admired. Over two decades after Brown’s death, Thomas Hovenden portrayed Brown as a saint. As he is lead to his execution for attempting to destroy slavery, Brown poignantly leans over a rail to kiss a black baby. 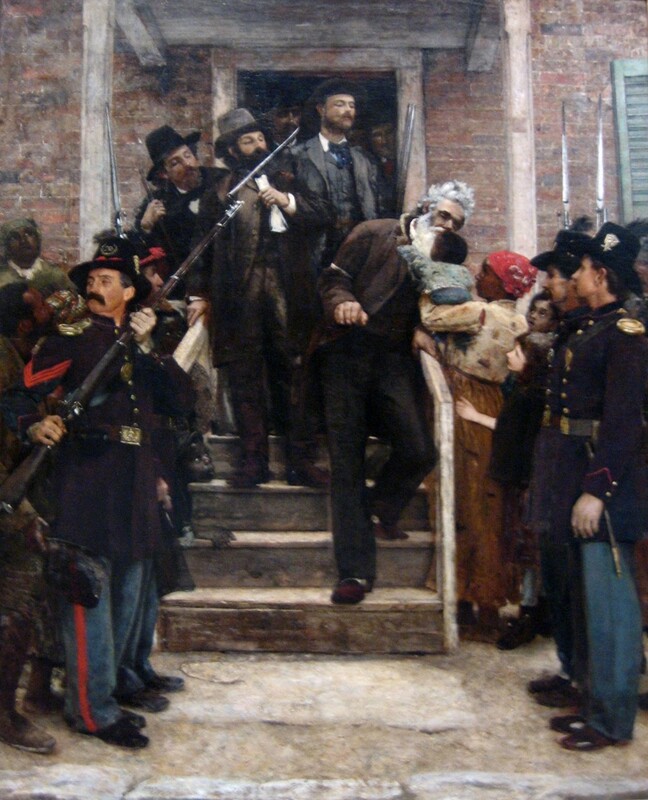 Thomas Hovenden, The Last Moments of John Brown, c. 1882-1884. Wikimedia, http://commons.wikimedia.org/wiki/File:%27The_Last_Moments_of_John_Brown%27,_oil_on_canvas_painting_by_Thomas_Hovenden.jpg. ¶ 74 Leave a comment on paragraph 74 0 Republicans wanted little to do with Brown and instead tried to portray themselves as moderates opposed to both abolitionists and proslavery expansionists. In this climate, the parties opened their contest for the 1860 Presidential election. The Democratic Party fared poorly as its southern delegates bolted its national convention at Charleston and ran their own candidate, Vice President John C. Breckenridge of Kentucky. Hoping to field a candidate who might nonetheless manage to bridge the broken party’s factions, the Democrats decided to meet again at Baltimore, and nominated Stephen A. Douglas of Illinois. ¶ 75 Leave a comment on paragraph 75 0 The Republicans, meanwhile, held their boisterous convention in Chicago. The Republican platform made the party’s anti-slavery commitments clear, also making wide promises to its white constituents, particularly westerners, with the promise of new land, transcontinental railroads, and broad support of public schools. Abraham Lincoln, a candidate few outside of Illinois truly expected to win, nonetheless proved far less polarizing than the other names on the ballot. Lincoln won the nomination, and with the Democrats in disarray, Republicans knew their candidate Lincoln had a good chance of winning. 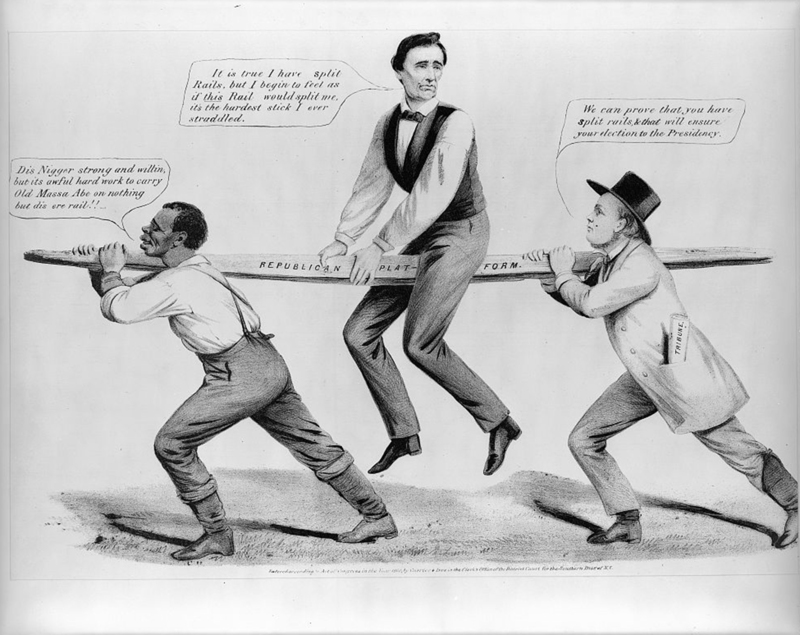 ¶ 76 Leave a comment on paragraph 76 0 In this political cartoon, Abraham Lincoln uncomfortably straddles a rail supported by a black man and Horace Greeley (editor of the New York “Tribune”). The wood board is a dual reference to the antislavery plank of the 1860 Republican platform — which Lincoln seemed to uneasily defend — and Lincoln’s backwoods origins. Louis Maurer, “The Rail Candidate,” Currier & Ives, c. 1860. Library of Congress, http://www.loc.gov/pictures/item/2001703953/. ¶ 77 Leave a comment on paragraph 77 0 Abraham Lincoln won the 1860 contest on November 6, gaining just 40% of the popular vote and not a single southern vote in the Electoral College. Within days, southern states were organizing secession conventions. John J. Crittenden of Kentucky proposed a series of compromises, but a clear pro-southern bias meant they had little chance of gaining Republican acceptance. Crittenden’s plan promised renewed enforcement of the Fugitive Slave Law, and offered a plan to keep slavery in the nation’s capital. Republicans by late 1860 knew that the voters who had just placed them in power did not want them to cave on these points, and southern states proceed with their plans to leave the Union. On December 20, South Carolina voted to secede, and issued its “Declaration of the Immediate Causes.” The Declaration highlighted failure of the federal government to enforce the Fugitive Slave Act over competing personal liberty laws in northern states. After the war many southerners claimed that secession was primarily motivated by a concern to preserve states’ rights, but the very first ordinance of secession’s primary complaint, and many that came after, listed the federal government’s failure to exert its authority over the northern states. ¶ 78 Leave a comment on paragraph 78 0 The year 1861, then, saw the culmination of the secession crisis. Before he left for Washington, Lincoln told those who had gathered in Springfield to wish him well and that he faced a “task greater than Washington’s” in the years to come. Southerners were also learning the challenges of forming a new nation. The seceded states grappled with internal divisions right way, as states with slaveholders sometimes did not support the newly seceded states. In January, for example, Delaware rejected secession. But states in the lower south adopted a different course. The State of Mississippi seceded. Later in the month, the states of Florida, Alabama, Georgia, and Louisiana also all left the Union. By early February, Texas had also joined the newly seceded states. In February, southerners drafted a constitution protecting slavery and named a westerner, Jefferson Davis of Mississippi, as their President. When Abraham Lincoln acted upon his constitutional mandate as Commander in Chief following his inauguration as President of the United States in Washington on March 4, rebels calling themselves members of the Confederate States of America opened fire. Within days, Abraham Lincoln would demand 75,000 volunteers from the North to crush the rebellion, and the American Civil War began. ¶ 80 Leave a comment on paragraph 80 0 Slavery had long divided the politics of the United States. In time, these divisions became both sectional and irreconcilable. The first and most ominous sign of a coming sectional storm occurred over debates surrounding the admission of the State of Missouri in 1821. As westward expansion continued, these fault lines grew even more ominous, particularly as the United States managed to seize even more lands from its war with Mexico. As the country seemed to teeter ever closer to a full-throated endorsement of slavery, however, an anti-slavery coalition arose in the middle 1850s calling itself the Republican Party. Eager to cordon off slavery from where it already existed, it arose to win the Presidential Election of 1860. ¶ 81 Leave a comment on paragraph 81 0 Throughout this period, the mainstream of the anti-slavery movement remained committed to a peaceful resolution of the slavery issue through efforts understood to foster the “ultimate extinction” of slavery in due time. But as the secession crisis revealed, the South could not tolerate a federal government working against the interests of slavery’s expansion and decided to take a gamble on making war with the United States. Secession, in the end, raised the possibility of emancipation through war, a possibility most Republicans knew, of course, had always been an option, but one they nonetheless hoped would never be necessary. By 1861 all bets were off, and the fate of slavery depended on the violence of war.